Saxophonist Mark Lockheart is playing standards at the 606 later this month. 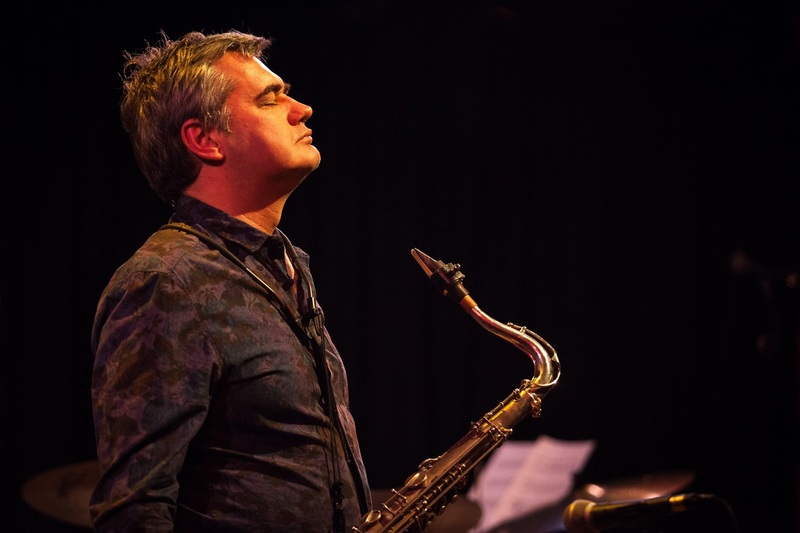 The club's marketing manager Laura Thorne grabbed a few moments with him and kindly shared them with LondonJazz News. Laura Thorne: Jazz music can be defined in various ways, some of which are objective though many less so. Mark Lockheart: For me, jazz is a broad term that covers everything from Count Basie to the Bad Plus and everything in between. I think there has to be a healthy element of improvisation in the music for it to be jazz, but it is really hard to define completely what makes jazz. For me personally, the most interesting and vibrant jazz music has bold, exploratory qualities and is performed by distinct musicians with unique sounds and approaches. For instance, I’ve always loved the fact that you can instantly recognise the sound and phrasing of musicians like Johnny Hodges, Wayne Shorter, Kenny Wheeler or Brad Mehldau. The essential quality that the best jazz has, in my opinion, is personality, and this has been at the core of my emotional (and intellectual) response to the music for as long as I can remember. LT: How would you describe your music? ML: As far as describing my own music, I would honestly have a tough job doing this accurately. I’ve listened so much to African American jazz but I’ve also listened and absorbed a lot of other music that doesn’t come so much from that. Having said that, I’m also always interested in exploring ways of playing standards and classic jazz repertoire and my gig at the 606 will be doing that, with help from Nikki Iles, Steve Watts and James Maddren. LT: What are the criteria that determine the choice of material that you'll perform on the gig? ML: I quite like to try different combinations of musicians that I haven’t worked with much when I play at the 606 but for this gig I wanted to explore a slightly different concept . I’ve decided to use the rhythm section from Nikki’s Printmakers band as I love the understated way this rhythm section plays together. The control and sophistication of these three musicians is really special and I think will suit the tunes I want to play - beautiful songs like A Nightingale Sang In Berkeley Square, Just In Time, Too Young to Go Steady are just a few we will be doing. I hope to make a CD of my favourite standards at some point, but in a way it's quite a challenging prospect due to the fact there are so many amazing records exploring standards, so I want to make sure I do it really well and do it with a lot of character. LT: When you were young, first discovering music and forming your own opinions about it, were there any specific experiences or moments that you can recall having an impact on you? ML: My dad would always play jazz in the house when I was growing up, so I was exposed to loads of music every day. He played a lot of Brubeck, Ella, Sinatra, Dankworth and Miles so I guess these were all important people. I was always attracted to the sound and groove of the music rather than the technical qualities, and I think this is still the case really. You hear some ridiculous things said about musicians when you’re young, for instance several people used to say to me that Wayne Shorter didn’t have a good technique, which is obviously absurd as, to me, technique in jazz music is really just there to enable you to express yourself fully. Jazz music that comes primarily from a technical aspect leaves me cold and has nothing much to do with the art form in my opinion. One funny thing I remember when I was about 14 years old was that I was reading an article in Jazz Journal about how Paul Desmond wasn’t very jazzy and didn’t play fast—basically saying his playing lacked energy or commitment. I was upset and wrote a very earnest letter defending Desmond and stating his qualities as I heard them, and they published my letter in the next edition. LT: You’re a composer as well as an instrumentalist, having written material for both your own projects as well as outside commissions. What inspires you to write? Is inspiration necessary? ML: For me it’s important I write to define myself as an artist. The process of writing music helps you understand structure, pacing and control, and these are all important things when you’re improvising on a gig. I don’t think everyone needs to write but it helps all my musical concepts a great deal. My saxophone playing is closely linked to my composing and often ideas for pieces come from improvising either on the sax or keyboard. My writing often suggests and leads into my next recording or project. Most recently, I’ve been composing music for a small orchestra and jazz quintet for a work titled Brave World. I just started writing it for fun (without a commission) but eventually managed to get Trinity Laban and Serious Productions involved, and between us this turned into a lovely first performance gig at last year’s London Jazz Festival. This was the first and only performance so far, but it was absolutely vital that I could rehearse and hear the piece before I record it with a professional orchestra—hopefully sometime later this year. Most recently, I’ve been writing material for a new album with my trio, Malija (with Danish bassist Jasper Hoiby and Liam Noble on piano), for a new CD that will be released in September on the Edition record label. LT: You’ve collaborated with a number of classical music artists, including Mark Anthony Turnage. Does your playing style change or adapt when you are working in that setting, and if so, how? ML: I love all kinds of music and perhaps because I studied classically I relish the opportunity to be involved in different things. The projects I’ve done with Turnage have all been amazing and have always kept me on my toes as I have to accurately play someone else’s music. There are always challenges with Mark’s stuff, not least following conductors that may have a completely different concept of where the beat is! I also remember playing in Mark’s opera Anna Nicole with fellow sax player Martin Robertson when we were both on soprano sax playing high unison lines—now that’s a challenge! I also worked with Perfect Houseplants on a few albums with the early music group The Orlando Consort, who were amazing. I think we all learnt a great deal from that collaboration in exploring the common ground between plainchant and jazz, etc. LT: You’ve been a member of two groundbreaking, acclaimed jazz groups, Loose Tubes and Polar Bear. What do you think made those groups so special? ML: With both these groups I learnt and developed so much over different points in my career. Both groups were unique and had their own sound and concept and I loved this feeling of being in a band that was exploring music and not recreating it. As a result, both bands became influential and groundbreaking in their own way. Interestingly, some people used to say that Polar Bear wasn’t jazz - to me, with its searching improvs and experimental sound worlds, it was the very definition of jazz!